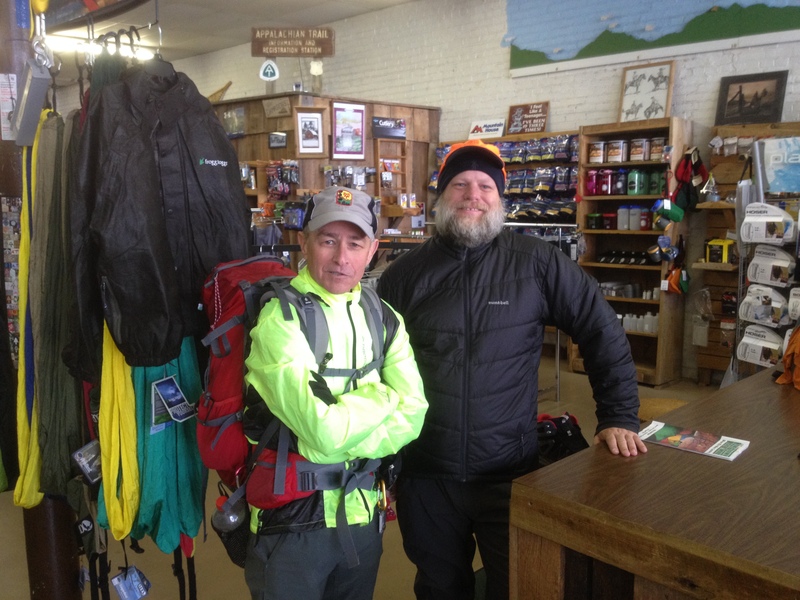 After a day hike, I ran into Winter Walker wearing his replacement garment at the outfitters. “I sure hope this isn’t pathogenic,” I said to Winter Walker. Winter Walker is a Vermonter I met at a shelter south of Damascus. In real life he’s a trucker whose doctor told him to “get healthy.” So Winter Walker set out on a “thousand mile diet.” His intent is to hike along the Appalachian Trail until he thins out. When I met him, he was making fantastic progress. When our paths crossed, Winter Walker had decided to begin his return trip. Once his goals are met, he’ll call relatives for a pick up. He figured that would be somewhere around Harpers Ferry assuming that severe winter weather didn’t interfere. He is one of the good guys one meets on the trail. In Spanish you’d describe him as muy amable. We enjoyed each other’s company, humor, and easy repartee. One evening he hung a fleece hoodie he’d sewn himself on a nail protruding from the shelter wall. He forgot there’s nothing a shelter mouse won’t eat. As the waxing moon glittered on the snowscape embracing our shelter, a stealthy field mouse munched away. By morning the mouse had carved out chunks of his hood that reminded me of a Congressional assault on the federal budget. The mouse was either after salt residue or trying to feather its nest. Regardless, the hood was so full of holes that it could have been repurposed as a Green Bay Packer cheese head. It was hardly recognizable for its original purpose. Characteristically, Winter Walker found the humor and made the best of it. The fine folks at Mount Rogers Outfitters in Damascus would make a sale on a factory made replacement. Could the mouse have been in cahoots we pondered? “Great conspiracy theory!” I thought. No way, we concluded. Winter Walker’s misfortune is what thru hikers learn to take in stride. Just another bump in the road. That morning, we packed up as the heavens began to cry rain with a volume your favorite high pressure shower head could only imagine. “Let’s aim for early lunch at the Blue Blaze,” he suggested. “Bingo!! !” I thought. I’ll be needing an injection of hot nutritious food. It was 10 miles, mostly downhill, to Damascus. We’d make short work of that, and we did. When we sopped through the Blue Blaze’s welcoming entrance, we made a beeline for seats at the bar. It was about 11:30, so we weren’t there to swill beer. We just wanted to be closer to the eats and faster service. It proved to be a good decision. Enter my dilemma. Pony, the Blue Blaze’s owner and chef, peppered me with choices. Did I want the all-you-can-eat special, something from the menu, what to drink, and appetizer, did I have a trail name, why NOBO now, and more ? Whoa! Waaay too much, too fast. I couldn’t process it all. On the trail, things are fairly simple. One foot in front of another. Mind the slippery spots. I might add here that I hate exposed roots far more than slick rocks. More on the philosophy of roots another time. While thru hiking, it’s best not to think too far ahead. My time horizon spans the capacity of one food bag. When it’s empty, I have to do what’s needed to fill it up. In between times, I stay inside the day at hand and the 2 X 6 rectangle of trail immediately to my front. Success is usually defined as not falling and making it before dark to that day’s goal. Back to the bar. This wasn’t my first time with an overwhelmed processor. It happens every time I go to town. On the trail, your senses evaluate very different information. The cues are the sights and sounds of nature. Everything slows down. Your brain adjusts from highway speed to something more civilized to say the least. It’s not less, but more in a vastly altered context. So, when Pony asked me to make a bunch of choices, my mind hadn’t made the transition. My aside to Winter Walker was rhetorical. I knew it wasn’t caused water I might have forgotten to treat. Instead, it was a prime symptom of the best part of my hike. It’s evidence of the transition from the inhuman pace of corporate existance to a more sustainable speed for a longer and more healthy life. Continued good fortune with your transition. You write well.